George Nicolson’s are a second generation family business. Joint Managing Directors, Barrie and Ewan Nicolson, along with Director, Jeremy Tempest-Mitchell, as well as several other key members of staff joined the business over 20 years ago. We also have a small group of shareholders who are employees of the business. 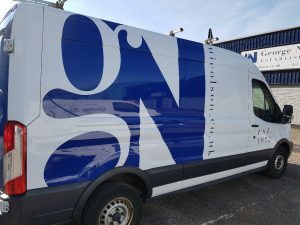 The business was started in 1972 by George Nicolson with nothing more than a garage lock up, a friend who was a painter & decorator and the will to succeed. Having moved premises a few times, the company settled in their current offices at Salamander Street, Leith in 1991. Throughout this time the business has grown steadily. For many years we have focused on the commercial market through redecoration of banks, public houses, hotels, large private houses and offices, building a reputation for high standards throughout the industry. Over the past 15 years, George Nicolson’s have branched out into principal contracting within the hotel, restaurant, public house and small to medium sized office markets. Working directly with clients, designers, surveyors and architects we deliver the whole package to meet clients standards, budgets and programmes. With the experience we have, along with an established and reliable chain of suppliers and sub-contractors, this area of the business has continued to expand and develop. Over the past few years, acquiring another painting & decorating business allowed us to also move into the residential and private markets. Henderson & Paterson, originally formed in 1932, were an established businesses in their own right. Now a division of George Nicolson, they still hold the same values and standards to this day. We strongly believe in training for growth throughout our workforce which includes, Health & Safety, First Aid, CDM, IT, trade and people skills as well as on-site and off-site management. The company also has an apprenticeship policy that enables us to develop our own tradespeople for the future. The Scottish Government has partnered with Investors in People Scotland to create a new accreditation: The Investors in Young People Award. This Award is a framework of good practice that seeks to recognise and reward employers who have a track record in recruiting and retaining young people. As an important part of the Investors in Young People assessment process, a selection of people from the company talked about various aspects of their role, the organisation, as well as the support and development they have received. The company’s ongoing commitment to Young People was recognised as following a successful assessment, we were very pleased to achieve Investors In Young People accreditation. 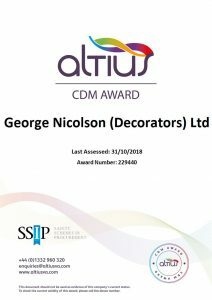 As an active member of the Scottish Decorators’ Federation, this allows us to keep up with the latest legislation as well as working closely with Construction Skills, colleges, suppliers and many other organisations. Our company continues to be an Altius approved vendor. Altius is a well-respected robust online assessment process which focuses on key areas such as CDM, Risk Management, Customer Service, Quality Management and Commercial and Corporate Social Responsibility. Extensive experience in complex, large and demanding supply chains, combined with a proven track record of using modern information technology, gives Altius a unique ability to quickly deliver valuable benefits to their clients.